tDCS - Safety Designed Transcranial Direct Current Stimulation (tDCS) Device with 4 Selectable Current Levels, Advanced Circuitry, LED Lit Screen for Safe Nighttime Use. 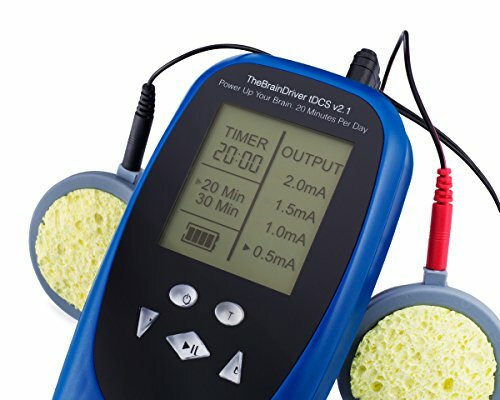 TheBrainDriver Deluxe tDCS System Includes Everything You Need to Get Started; Main Unit, Comfortable Electrode Positioning Headband, Color-coded Wire set, 2 Color-coded Electrodes, 2 Pairs of Sponges, 9 volt Battery, Storage Case. Device Output Selections; 0.5mA, 1.0mA, 1.5mA, 2.0mA. Plus, Numerous Safety Features; Battery Level Indicator, 20 & 30 Minute Timer with Automatic Shut-Off at End of Session, Automatic Shut-Off When Not In Use, Automatic Shut-off when Not Properly Attached, Overload Protection. Pocket-Sized & Very Portable for Easy Travel! If you have any questions about this product by TheBrainDriver, contact us by completing and submitting the form below. If you are looking for a specif part number, please include it with your message.